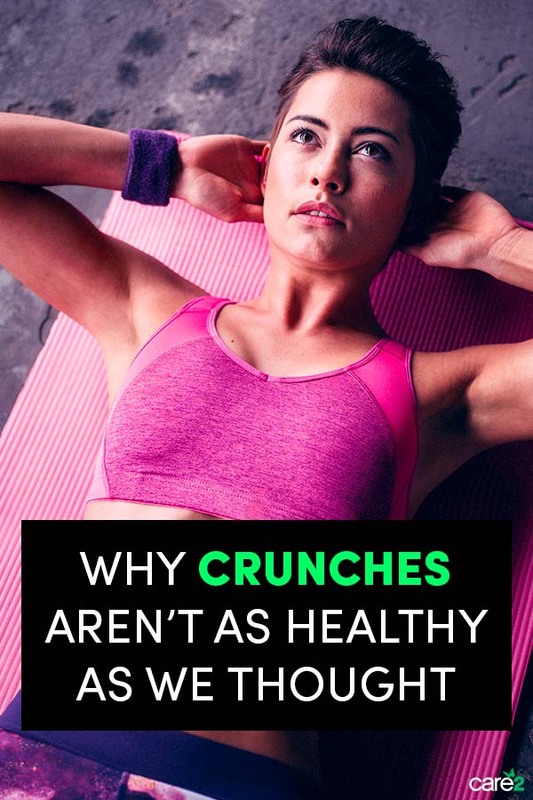 Care2 Healthy Living | Okay, Are Crunches Actually Bad for Us? If you want to start focusing on your core strength (which, let’s be honest, we all should) and you start doing some exercise research, you begin to encounter two camps: diehard crunchers and avid non-crunchers. And no, we’re not talking about eating carrots. We’re talking about the best way to firm up your belly. Upon first glance, crunches are a great exercise. You can do them anywhere, they’re free and they activate almost the entire length of your abdominal muscles, top to bottom. What could be bad? Here’s the problem with crunches: the repetitive motion can stress and injure your spine. When you’re doing a classic crunch, the natural curvature of your spine flattens against the floor. This puts pressure on the delicate fluid sacs between your vertebrae. Over time, these sacs can start to bulge and lead to herniated discs. Repetitive crunching can also put painful pressure on spinal nerves, leading to lower back pain. Probably not what you had in mind when you decided it was time to get stronger, right? But wait—what about sit-ups? Unfortunately, those aren’t much better. They still encourage the repetitive motion, which can cause lower back injury. In fact, sit-ups do this even more so, since they require a greater range of motion. Regardless of whether you sit up or crunch, both can encourage poor posture and bodily imbalances. For one, if you aren’t being cautious, these spine-flattening movements can lead to an overly-tucked tailbone when standing, which puts your spine at further risk for injury. They can also lead to incredible tension and tightness in the hip flexors, which throws body positioning out of whack and can even lead to lower back pain. And neither crunches nor sit ups actually work the deep core muscles, which are the most important. Both exercises are pretty ineffective when it comes to tackling the entire core system. If you’re a diehard cruncher, you can practice your crunches more safely by wedging your hands underneath your lower back. This supports the natural curve of your spine and ensures that those precious discs don’t get damaged. It’s still not the ideal core workout, but at least it’s a lot safer. 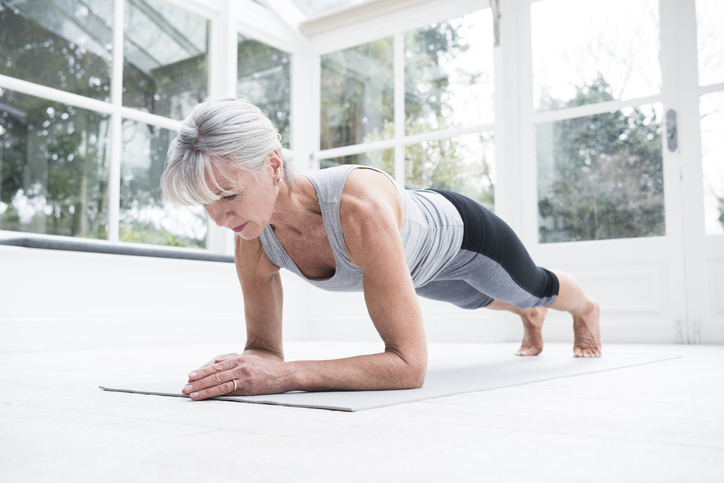 To really reap major core benefits, try proper Pilates roll-ups or planks to strengthen the full gamut of abdominal muscles. It’s all about choosing one workout that will tackle all facets of your core, not just your six pack muscles. 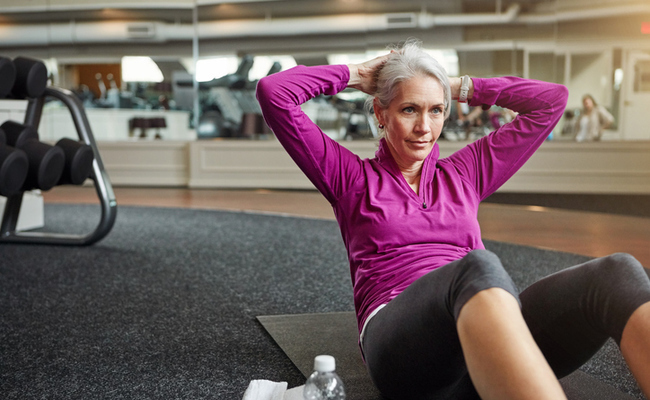 By cutting out crunches and sit ups and getting smart with your workouts, you’ll have better posture, a safer spine, and a significantly stronger stomach in no time. I beg to differ with this article. There will probably be an article up next week here saying that these exercises are good for you. Thanks. I do planks and I know they're a work out!